The Embassy of Argentina, in collaboration with the Barbados Turtle Project, invites you to join them for Sea Turtles. 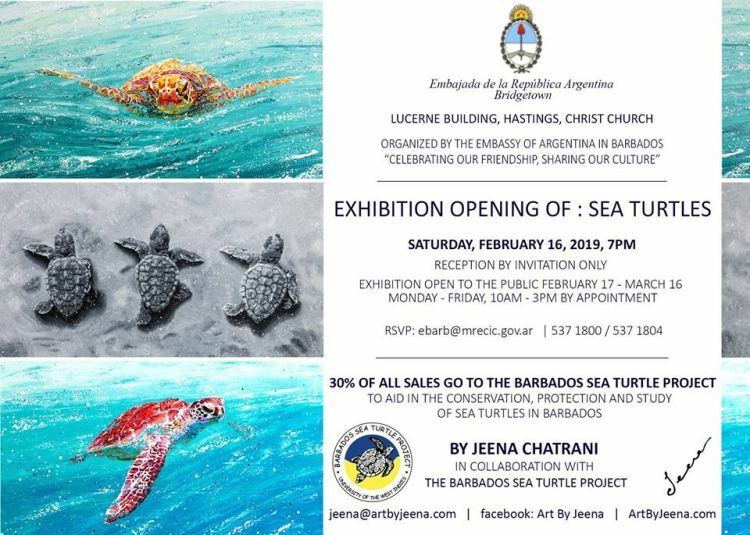 Sea Turtles is an Art Exhibition showcasing the works of Barbadian artist Jeena Chatrani. The exhibition will be housed at the Embassy of Argentina, Hastings. Exhibition ends on Mar 16th. Call 537-1800 or 537-1804 to make an appointment. 30% of all sales will be going to the Barbados Sea Turtle Project to help with the conservation, protection and study of sea turtles.